For a picture that looms large in cult-filmographies, and has a celluloid DNA link with THE EXORCIST, William Peter Blatty's 1979 darkly comic psychodrama THE NINTH CONFIGURATION is far too rarely seen. Even on VHS it was a rarity; I was floored when I found a copy at a now-defunct Corena's Video in Lakewood in the late 1990s. Quite possibly a highlight of my life, too. It was mostly downhill from there. Blatty, of course, is the author of the novel The Exorcist but also had a longtime track record as a TV gagwriter and novelist. If memory serves, he actually finessed this material in two novels before, one a really surreal-absurdist thing entitled Twinkle Twinkle `Killer' Kane (I got a hardcover out of the Cleveland Public Library; one of the few books I never finished, along with THE JOY LUCK CLUB. No wonder Amy Tan never calls), the other a more realistically told Ninth Configuration. Subsequently Blatty, as a first-time director, shot THE NINTH CONFIGURATION in Eastern Europe (mostly at a castle in Soviet-era Hungary). The resulting unclassifiable melange of military horror, madhouse satire, Vaudeville comedy, whodunit, and religious/philosophical debate puzzled many a distributor, and I am given to understand that even Blatty cut and re-cut it many different times for different releases (some of which were, in fact, titled TWINKLE TWINKLE `KILLER' KANE). I am told this latest one is his final approved version, though I cannot really tell you how it differs from the VHS, which I gave away a long time ago - I think to a Christian-oriented film fan who might have gotten the most out of it. So consider it prime alterna-Easter viewing. An anarchic US military mental hospital in a castle in the Pacific Northwest is maintained late in the Vietnam War era by the US military, for observation of an alarming epidemic of officers gone crazy. Enigmatic Army psychiatrist Col. Hud `Killer' Kane (the truly amazing Stacey Keach) arrives to behold an institution where boundaries between doctor, guard, utter lunatics and faking malingerers have grown imperceptible. Kane attempts a fresh course of therapy that largely involves allowing the madmen freedom to act out their fantasies, even one officer attempting to stage Shakespeare with an all-dog cast - a component of one pretty wild, long continuous-take scene that I promise you won't soon forget. Kane also takes special interest in a rebel NASA astronaut (Scott Wilson), incarcerated for aborting a moon launch at the last minute due to a bad case of existential dread. And it is not too much of a spoiler to say that Kane has a few mental problems of his own. Blatty stages funny, compelling and occasionally alarming dialogues over science vs. religion, faith vs. cynicism, good vs. evil, what evidence there is for the existence of a benevolent and ethical God (referenced in the title). Not bad for a first timer - though Blatty does kind of fall back on [SPOILER ALERT] a tiresome plot device of a convenient biker-bar fight for a last-act catharsis, even if it does allow a key role for the late bad-guy specialist Richard Lynch (one of many I-know-the-face-but-not-the-name great character actors in the cast, including Blatty himself). Some day I would like to see a movie in which guys walk into a biker bar and there isn't a fight. Maybe that scene exists in a NINTH CONFIGURATION alternative cut. Even so, this brainy, neglected masterwork is a personal favorite of mine, and I think parts of it will stay with you for a long time afterward. Then again, the Cinematheque booked the film on my advice, possibly only the second time in history that's ever happened. This is Cleveland, after all, and by screening time most of the town will still be in ICU comas or hangovers (or still drinking) from our annual celebration of that great alcoholic holiday, St. Patrick's. Wish I was in Cleveland to see it - it might just be worth the trip. A cool side note: the astronaut in the film is the same character in The Exorcist who Regan freaked out at the dinner party. 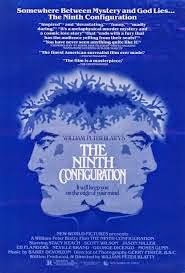 I've read that the tenuous link between THE NINTH CONFIGURATION and "The Exorcist" is that the astronaut played by Scott Wilson in THE NINTH CONFIGURATION is the same one who was at the party in "The Exorcist" and told by Regan; "You're going to die up there"